« Back to school with a handheld or smartphone. In March of this year we moved to the area of Riverside South in Ottawa, which is just a few minutes north of Manotick. 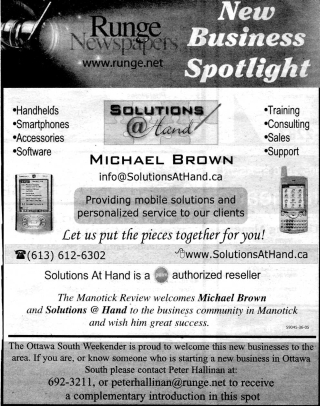 Solutions At Hand was recently welcomed to the Ottawa South/Manotick region by a New Business Spotlight in the Runge Newspapers “Ottawa South Weekender” and “Manotick Review”. We’re pleased to be living and working in this area, which is a beautiful and vibrant part of Ottawa. This entry was posted on September 9, 2005 at 8:56	and is filed under In the Media. You can follow any responses to this entry through the RSS 2.0 feed. Both comments and pings are currently closed.